Getting your home ready doesn’t have to be expensive or terribly time-consuming. It’s about presenting your home in the best possible light. 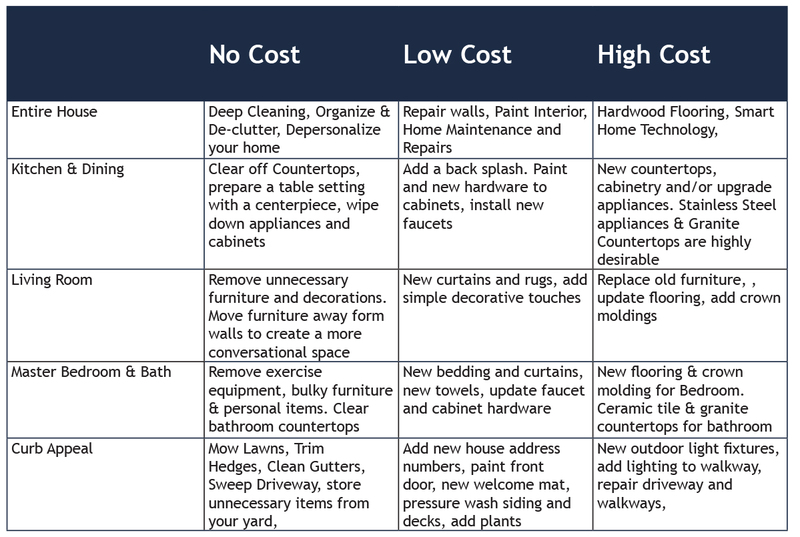 There are three kinds of improvements that will help draw buyers and the best price: renovations and upgrades, maintenance and repairs, and cleaning and organizing. Renovations and major upgrades should only be done if it is essential to getting your home sold, as renovations costs are rarely recouped in the sale price. Your home is about to go on “first dates” with potential buyers. Investing a little time and money to give buyers the best first impression will be key to selling your home faster and at the best price. It’s all about first impressions! A good place to start is giving your home a deep cleaning. Inspect your walls, chances are they are worse than you think. Repair holes and dings. Apply a fresh coat of paint to the rooms that are in need. Hire a professional to clean your carpets. Declutter and organize your home. Less is more, buyers want to be able to picture themselves living there, not you. Clear off your kitchen and bathroom countertops. Straighten up and organize your closets. Minimalize your rooms. Arrange your seating in your living room with conversation in mind and not the television. Store bulky furniture. If you have a lot of stuff, consider renting a storage unit to store the extra furniture and household items. Depersonalize, remove or minimize family photos, trophies, awards and personal items. It’s time to knock off all the home repairs and maintenance items on your to-do. Brighten your home by replacing any burnt out light bulbs! While you're changing them out you may want to consider replacing them with energy-efficient LED bulbs. More and more homebuyers are looking for Smart Homes. Consider making small investments in Smart Home Staging. Remove any odors. Be mindful of pets, litterbox, hard water, cooking and smoking odors. Maximize your curb appeal. Clean the gutters, mow the lawn, trim the bushes. Sweep the driveway. Clean off the outdoor patio and furniture. Remove and store any unnecessary items from your yard. If you have a pool, make it sure it clean and functioning properly. Our Agents can help identify ways to maximize your home’s appeal. Need a little help? Check out our recommended Home Service Providers, including a Home Stager and Organizer to help you get started.